In the State of Michigan, the administration and distribution of estates is governed by MCL Chapter 700, known as the estates and protected individuals code. When a Michigander dies, probate -- the process of settling a decedent's estate, including gathering the decedent's assets, paying debts and taxes, and distributing what is left of the estate to those entitled to receive it -- takes place in the county in which the decedent was domiciled at the time of death. Michigan Probate Courts oversee probate proceedings. The extent to which the court supervises administration is dependent upon the type of probate opened. Administration of the estate is generally unsupervised, unless the specific situation necessitates otherwise. All property owned by the decedent individually is subject to probate. Property held with a survivorship interest, beneficiary designation, or in a trust skips probate. Administration officially begins when the court appoints a personal representative (PR) who will personally settle the decedent's estate. 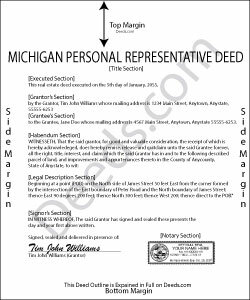 Michigan uses the general term personal representative, though he or she may be either the executor of the decedent's will, or an administrator of an intestate estate. An estate is said to be intestate when the decedent dies without a will. The court issues letters of authority to the PR, which confirm the personal representative's powers. In Michigan, the PR's powers are quite broad, unless otherwise limited by a decedent's will. Any restrictions on the PR's powers are noted in the letters of authority. time of his or her death to any devisees or heirs at law. Pursuant to MCL 700.3910, an instrument or deed of distribution is proof that the distributee has succeeded to the decedent's interest of the estate in the distributed property. See special provisions relating to distribution under the estates and protected individuals code, and contact a lawyer with questions. In some cases, the PR may be required to sell real property on behalf of the estate (to pay the decedent's debts, for example). A PR does not, in general, need to seek court approval before selling real property, barring restrictions stated on the letters of administration. However, if complications arise, the PR or an interested person (person having a property right in or claim against the estate) may file a petition and an order may be entered by the Probate Court. To accomplish a sale of the decedent's property, the PR executes a type of fiduciary deed called a personal representative's deed, which transfers title to the grantee. In Michigan, the PR deed typically carries a limited warranty, covenanting that the grantor warrants and defends the title against lawful claims arising from persons claiming by, through, or under the grantor (but none other). A PR deed includes information about the probated estate, including the decedent's name, county in which probate is open, probate file number, and source of authorization for the conveyance. All requirements of form and content for instruments pertaining to real property must be met. Each PR must sign the deed for a valid transfer. Consult a lawyer with questions regarding estate administration and personal representative's deeds in Michigan, as each case is unique.